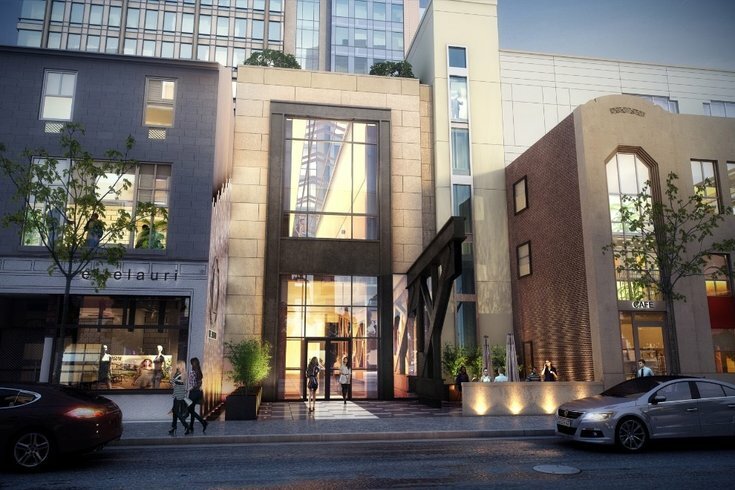 A rendering of The Harper, 24-story luxury apartment building coming to Rittenhouse. CookNSolo Restaurants, headed by James Beard-Award recipients Steven Cook and Michael Solomonov, are opening a new restaurant in Rittenhouse. No news on what they will serve, but we can guess considering the duo are the masterminds behind Philly's Israeli and Jewish cuisine, penning cookbooks "Zahav," and their latest, "Israeli Soul." Together they also have opened Zahav, Dizengoff, Abe Fisher, The Rooster, Goldie, and Federal Donuts. The restaurant will be on 19th Street a part of The Harper, a luxury 24-story apartment building owned by Pearl Properties and named after James Harper, Rittenhouse Square’s first builder and a former congressman. The building will feature premier amenities, such as a fitness center, dog park, 10,000 sq. ft. elevated green roof/park, yoga studio, indoor basketball court, and underground garage. The partners currently have new restaurants coming to Kensington and Center City near 12th and Sansom streets. The Harper restaurant is set to open some time in spring 2019.